Καλό Πάσχα! Happy Easter! Χριστός Ανέστη! Christ is Risen! Αληθώς Ανέστη! Truly He is Risen! We’re just back from Antonia’s house where we ate too much Easter dinner. Antonia goes all out every year with an amazing Easter spread: lamb, moussaka, pastitsio, spanakopita, tsoureki, koulourakia, and salads of every kind. On Easter, no one leaves Antonia’s house - or any Greek’s house - hungry. The amount of food is similar to what one sees at an American Thanksgiving dinner. I’m never eating again. At least not until tomorrow. Last week we had our first fresh halibut of the year and broke out the grill in its honor. Halibut is a flatfish with white meat. An average-sized halibut weighs about 25 pounds (a little over 10 kilos), although large halibut can weigh over 500 pounds (about 225 kilos). Frozen halibut is fine, but the texture and flavor of fresh halibut is far superior, so it's always a happy day when the new halibut season starts. Because halibut is meaty, it makes wonderful kebabs, aka souvlaki. I usually make halibut souvlaki with onions and bay leaves, but last week I used a new recipe from an award-winning Greek cookbook called Γεύσεις της Θάλασσας (Tastes of the Sea). 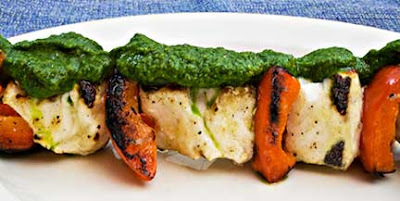 For this Halibut Souvlaki, chunks of fish are alternated on a skewer with red pepper pieces and topped with an herby, garlicky green sauce. The full-flavored sauce nicely complements the smoky red peppers and mild fish. The original recipe used two kinds of fish on the skewers; next time I make this, I’ll use both salmon and halibut. This quick and easy recipe packs a lot of flavor. It’s perfect for a mid-week meal, and is tasty and pretty enough to serve to company. Any fish that can be cut in large chunks may be substituted for the halibut. Cut the red peppers in half lengthwise and remove the stems and seeds. Cut each half pepper into lengthwise thirds, and cut each third in half crosswise. Put all the sauce ingredients in a blender and blend until smooth. Taste and add salt or freshly ground black pepper as needed. Starting with red pepper, alternate the peppers and fish on skewers. Season lightly with salt and freshly ground black pepper. Grill over a hot fire, or on a white hot cast iron grill pan. Halibut cooks very quickly, and is dry when overcooked, so watch it carefully. Serve the skewers drizzled liberally with herb sauce. This is my entry for Weekend Herb Blogging, hosted this week by Margot from Coffee and Vanilla. I'm glad you enjoyed Easter..I'm feeling a little "over fed" too! Great souvlaki Laurie. Halibut works perfectly on the skewers. I love halibut but it's prices here make it a luxury. I found a translation for Halibut = "ippoglossa" in Greek! Also, your link to the cookbook is busted...I'm interested in it. This pinchos look so inviting! I bet they tasted great!!! I'm taking the dust of my BBQ and this sounds so nice to me!!! Like the idea of adding salmon too! Αληθώς Ανέστη, Halibut souvlakia sounds wonderful, maybe can try this with sword fish and salmon. Alithos Anesti! Sounds like you had a fabulous time. These kebobs sound & look wonderful. The picture makes me hungry! These look so fresh and delicious! I hope you had a nice Easter. I ate too much, too...but it was mainly diples, karithopita, melomakarona, tsoureki...yeah, I don't know if I can button my pants tomorrow :) Christos Anesti! Laurie, this herb sauce looks fabulous. I bet I'd find myself dipping bread into it and eating it in the kitchen before I served it! this dish reminds me so much of what we can look forward to for an outdoor summer meal - grilled fish and vegetables, perfectly light and tasty. I am really liking the ingredients in that green sauce! What a perfect combination for the fish! Glad you had a wonderful Easter! What a wonderful sounding recipe. I can imagine how fabulous this must taste with the green sauce. Sigh, halibut is one of the very most expensive types of fish here so I rarely buy it. I love fish, but I'm always running out of ideas when it comes to how to cook it! This looks really flavorful, and I imagine the flavors from the veggies enhance the taste of the fish -- it looks very tasty and healthy, a great combo :). Funny, this looks like a dish for May in California, not April in Alaska. Did your snow melt? Halibut is a good kebab fish - can you get swordfish up there? Belated Easter greetings! We're definitely trying this fabulous herb sauce and fish souvlaki. I'm thrilled to read about your recent press about your book -- I had a chance to catch up with it again during our week off the grid. The Easter bread recipe you posted reminds me that the first Greek recipe I ever tried was for this bread -- I can't wait to try your recipe. What a wonderful way to cook fish! And the photo is beautiful. Your Easter feast sounded wonderful! 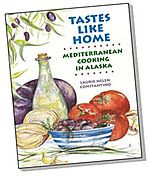 I like the recipe too...I had halibut for the first time when I was in Alaska (yall were in Greece at the time I think) and it was delicious...I am hooked. Hi all - I'm back from my Easter break and was so happy for all the great comments! Peter G - I hope your eating has gotten back to normal! I'm heading over to see what you've been up to as soon as I answer my mail. Margot, you're so welcome - thanks for hosting! Valli, yes, you're lucky enough to also live in a place with wonderful fresh halibut. I hope you'll like it for souvlaki! Peter M. - you'll just have to come visit me or Valli or both and we'll feed you all the halibut you can eat! Ippoglossa - thanks! On the cookbook link, it seems to be working now - I sent you a private email about this. Nuria - fish on the BBQ is one of my favorite foods of all time. I really like the smaller Mediterranean fishes grilled. YUM! Ivy, you could definitely do this with swordfish and salmon. I'd definitely eat it!! Cheryl, you've hit on one of the problems of reading food blogs - they really make you want to eat! Everybody cooks such great food. Elly, mmmm diples - did you make them?? They are addictively scarily good. Lulu - were you watching me in the kitchen sneaking tastes of the sauce?? Maria, you've just described the ideal summer meal. Kalyn, that's too bad about halibut, but really, the basic recipe can be used for any kind of fish that is large enough to cut into chunks. Cod, for example, is a good choice for souvlaki. Sophie, yes, the roasted peppers do enhance the fish's flavor. Glad you liked it! Hank, I'd say it's a dish for anyone, anytime! Our snow did melt, thank goodness. You can buy swordfish here occasionally, but it is not local and I try to stick with local fish so I've never bought it. I've had swordfish in Greece and loved it, and think it would be lovely with these souvlakia. AFOS, I've got 4 with your name on them! Manju, tsoureki is a great place to start cooking Greek food as it's so tasty. Thanks for the kind words! Katiez, I couldn't agree with you more - anchovies aren't used often enough given how much flavor they add to food.